ExVeritas offer management system certification over a range of industry sectors. We specialise in combing audits to minimise your time and cost for these essential services. By using auditors skilled in multiple fields, for example ATEX and ISO9001, we can combine audits and add value in all areas of your business simultaneously. We can undertake an audit (after an optional gap analysis) of your business to ISO 9001. This is a two stage process, firstly we review your documents and procedures (desktop) and feedback any necessary changes for compliance with ISO9001:2015, then we audit the business to ensure you are following your own processes and procedures. E xveritas conduct manufacturing audits (as an ATEX Notified Body) that can lead to ATEX Quality Module Certification being issued if the findings are satisfactory. ATEX Quality Modules are required for CAT 1 equipment and Category 2 electrical equipment. 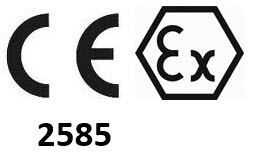 Once you have obtained the appropriate Quality Module for the type of equipment and protection concepts used, you will be able to manufacture ATEX equipment and use our Notified Body Number (2585) under your CE Mark to show that your Quality System is under the control of a Notified Body for the ATEX Directive. Exveritas conduct manufacturing audits (as an IECEx Certification Body) that can lead to IECEx Quality Assurance Registration being issued if the findings are satisfactory. IECEx Quality Assurance Registration is required for all IECEx Product Certification other than Unit Verification. Complete an on-line quote application form to get an ATEX, IECEx or combined audit for Ex Equipment Manufacture.